LOS ANGELES, (Variety.com) - "Crazy Rich Asians" has something to party about. Warner Bros.' highly anticipated romantic comedy launched above expectations with a five-day tally of $34 million when it opened in 3,384 locations. With a three-day weekend total of $25.3 million (19.84 million pounds), "Crazy Rich Asians" swam by fellow Warner Bros. title "The Meg," which earned $21.5 million in its sophomore frame. The shark thriller has amassed over $84 million in North America. Jon M. Chu's acclaimed movie -- the first studio film in over 25 years since 1993's "Joy Luck Club" to feature a nearly all Asian-American cast -- carries a modest $30 million budget. Enthusiasm has been strong for "Crazy Rich Asians," which arrives as Hollywood is being pressured to feature greater diversity on screen. It holds a strong 93 percent certified fresh rating on review aggregation site Rotten Tomatoes, along with an A CinemaScore. "Word of mouth is everything," Jeff Goldstein, Warner Bros.' head of domestic distribution, said of the film's better-than-expected launch. "This movie is so culturally significant and so unique in that there hasn't been a cast that's predominately Asian [in years]. This is one of those few projects that a whole studio comes together with lots of passion." 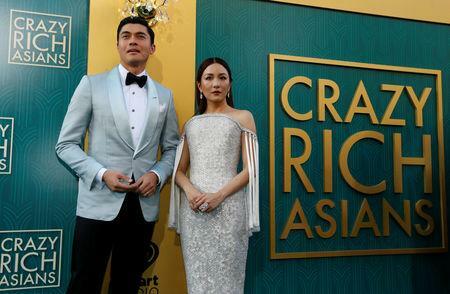 Based on Kevin Kwan's best-selling book, the movie follows Rachel Chu (Constance Wu), who accompanies her boyfriend (Henry Golding) to his best friend's wedding in Singapore. Upon meeting his parents, she quickly finds out his family is one of the richest (and most judgmental!) in Singapore. The cast also includes Gemma Chan, Awkwafina, Ken Jeong, and Michelle Yeoh. "Crazy Rich Asians" is the first romantic comedy in almost three years (since Amy Schumer's "Trainwreck") to open with more than $20 million. In recent years, the genre has struggled at the box office. Recently, Anna Faris and Eugenio Derbez' remake of "Overboard" debuted with a modest $14 million. Prior to that, "I Feel Pretty" -- with Amy Schumer, Michelle Williams, Emily Ratajkowski -- bowed with $16 million. Another new offering, Mark Wahlberg's "Mile 22" opened below estimates, pulling in $13.6 million in 3,482 theaters. "Mile 22" is the fourth collaboration between Wahlberg and director Peter Berg. The hope is that the action thriller will spawn a franchise, but that remains to be seen given the film's estimated budget is between $30 million and $50 million. The final weekend opener, "Alpha," debuted with $10.5 million in 2,719 locations. The film is backed by Studio 8 and distributed by Sony. Though it launched slightly above projections, it will still need to pick up steam during its theatrical run to justify a $50 million production budget. Meanwhile, Tom Cruise's latest mission is still proving to be a profitable one. "Mission: Impossible - Fallout" tied for fourth place with "Alpha," picking up $10.5 million in its fourth outing, bringing its domestic tally to $180 million. Overseas, it pocketed another $20.5 million for an international total of $320 million. At the specialty box office, "Juliet, Naked" made $60,000 when it opened in four venues. Based on Nick Hornby's novel, the movie -- starring Rose Byrne, Ethan Hawke, and Chris O'Dowd -- got rave reviews after it premiered at Sundance. "The Wife," with Glenn Close, Jonathan Pryce, and Christian Slater, scored the top screen average of the weekend. It earned $27,000 per location for a weekend total of $110,000. A strong opening for "Crazy Rich Asians," along with solid holdover from "The Meg" propelled popcorn season up 12.4 percent, according to comScore. Meanwhile, the year-to-date box office is up 8.8 percent.